When her grandfather dies, Tamar inherits a box containing a series of clues and coded messages. Out of the past, another Tamar emerges, a man involved in the terrifying world of resistance fighters in Nazi-occupied Holland half a century before. His story is one of passionate love, jealousy, and tragedy set against the daily fear and casual horror of the Second World War -- and unraveling it is about to transform Tamar’s life forever. I first read this book way back in 2005 when I took part in a school library scheme to assist with choosing the year's Carnegie Medal winner. I read the entire shortlist for that year, but Tamar was one of the two books that stood out to me the most. 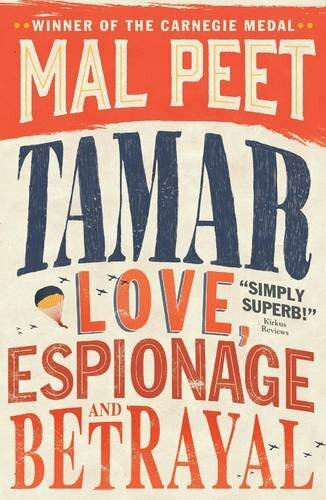 Tamar has always been one of those books which is always there in the back of your mind. Although I read lots, this is one of the few books I've never forgotten. So, when I was organising my extensive book collection a few months back, I decided it was high time I bought a copy and reread the story. Although you don't get quite the same effect reading it the second time around (mainly because you already know the big twist) it's still a fantastic read. I've always been drawn to World War Two era fiction, and Tamar is still one of my favourites. I love that Peet approaches the subject from a YA point of view, but still keeps it completely realistic. The horrifying nature of the war and the constant terror that gripped Europe at the time are not dumbed-down or desensitised for the younger audience. With Tamar, you get an unflinchingly honest and true-to-life account of the atrocities of the war. And what's even more horrifying is that many of the terrible events in the book are based on things that actually happened during the war. It's almost impossible to imagine what life must have been like, yet Peet manages to capture both sides of the coin impeccably. The fact that the story switches between the past and the present day should be confusing, but it actually works really well. The story of the past progresses as present-day Tamar finds out more and more about her family through the cryptic clues her grandad left to her. Both periods are united by the common themes of love, betrayal, and secrets, and this only serves to make the story even more effective, and ultimately, heartbreaking. Honestly, I just can't recommend this book enough. Tamar is available to buy now. Have you read Tamar? Let me know in the comments below!